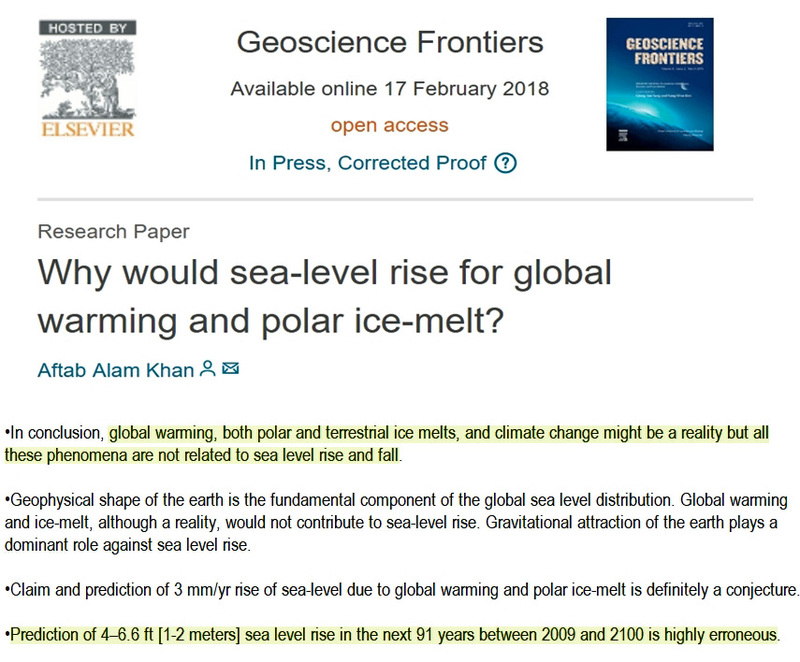 Geophysicist and tectonics expert Dr. Aftab Khan has unearthed a massive fault in the current understanding of (1) rapid sea level rise and its fundamental relation to (2) global-scale warming/polar ice melt. Succinctly, Dr. Khan concludes the two have little to nothing to do with one another. That’s because land height changes — subsidence (sinking) or uplift (rising) — connected to the Earth’s gravitational attraction and shifting plates assume the dominant role in determining sea level rise and fall. The extent to which thermal expansion from rising ocean heat contributes to sea level rise is, as Dr. Khan indicates, “definitely a conjecture”. Along the coast of Juneau, Alaska, for example, the land surface has been rapidly rising due to gravitational uplift for many decades. Consequently, relative sea levels are plummeting in this region at a rate of over -13 mm/yr (-5 inches per decade) according to NOAA. The opposite is occurring along the U.S. Gulf coast (Grand Isle, Louisiana), where the land area is sinking and thus sea levels are rising at a rate of over +9 mm/yr. Many other scientists have also concluded that “sea level rise is not the primary factor controlling the shoreline changes” in regions where sea level rise is quite high. Even at rates exceeding 5 mm/yr, sea levels aren’t rising fast enough to overcome the much more pronounced changes in coastal expansion due to accretion and uplift. This is not just a local phenomenon, either. 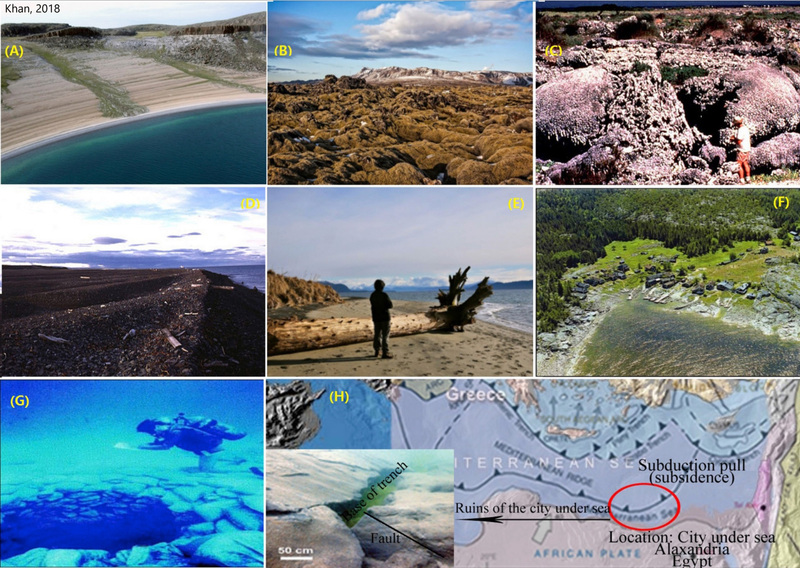 Instead of shrinking coasts and submerged shorelines due to global sea level rise and polar ice melt, scientists have found that the land area above sea level has been growing across the world since the 1980s (Donchyts et al., 2016) . . . during the same period of time that anthropogenic CO2 emissions were rising. Since 1958, sea levels have only been rising at a rate of between 1.3 and 1.5 millimeters per year, a rate of about 5 to 6 inches per century (Frederiske et al.,2018). Meltwater from the Greenland and Antarctica ice sheets combined has contributed just 0.59 of an inch to global sea levels during this period (Frederiske et al.,2018). Between 16,500 years ago and 8,200 years ago, by comparison, the average rate of global sea level rise was 1.2 meters per century (12 mm/yr), which is more than 800% faster than the rate achieved since 1958. 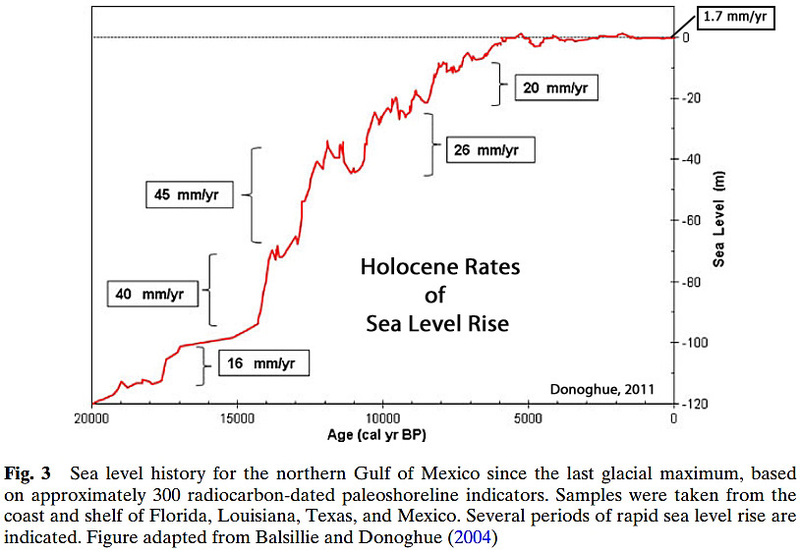 Included in that rate average is the “meltwater pulse” epoch around 14,500 years ago, when sea levels rose at rates of 4 meters per century (40 mm/yr). Donoghue (2011) provides a visualization of the insignificance of modern changes relative to the past. Scientists affirm that an anthropogenic fingerprint in sea level rise trends are currently still “too small to be observable”. Hence, suggestions of an anthropogenic influence on sea level change — the scariest aspect of climate modeling predictions — may be significantly undermined by scientific observation. Are Thermal Expansion–>Sea Level Change Models Accurate? Don’t confuse Alarmists with facts. It just makes them madder. A slightly bulging Pacific or Atlantic Basin would easily account for ALL of the tiny sea-level rise we have seen over the last century or so. A 1 C increase in temperature (at 10C water temperature) causes a 0.009% increase in volume. At 20 C it’s a 0.02% increase. With a total area of 361,900,000 km² and a volume of 1,335,000,000 km³ that means a 1K increase causes the volume to become something between 1,335,120,150 km³ and 1,335,267,000 km³. Assuming the area stay the same that’s a sea level increase of 33 cm to 74 cm. According to this (https://phys.org/news/2017-03-ocean.html) OHC increased by around 27 * 10^22 Joules in the last 30 years. Distributed over the 1.335 * 10^21 litres of water in the Ocean that 202 Joules per litre. That would mean the ocean has uniformly warmed by 0.05 C … the resulting sea level rise from this thermal expansion would be 1.7 cm to 3.7 cm over 30 years or 0.57 mm/yr to 1.23 mm/yr. You can determine for yourself if that is a significant contributor to sea level rise or not. SOLAR energy warming, out of the COLDEST period in 10,000 years. Nothing to do with CO2 or human influence of any sort. It appears then, that Maldives have missed the warming waters and sit in a cold spot of nonglobal warming. How lucky they were. Maybe the OHC growth has been overestimated? More like “Over FABRICATED and over ADJUSTED” !! Do you believe that ses lever rise is uniform or lesser along the shallower coastal lines? Summary: This research paper reads like a tutorial on sea level rise, and explains the geoscience behind fluctuations in observed sea levels over all time scales. It should be required reading for Judge Alsup, lawyers and litigants in these multiple lawsuits. Yes, I agree this should be considered a seminal paper. It needs much more attention than it seems to be getting. Sea level rise is pretty much the only legitimate concern that “global warming” might induce. But if we can’t even make the causal connection between “global warming” and sea level rise — even if we fully accept that humans are causing warming — then what, exactly, can be considered a concern in the modern era? Warmth is good for the biosphere. It’s Cold that’s catastrophic. Just ask Canadians if they would prefer not to be buried in a kilometer-thick ice sheet like they would be if this was 20,000 years ago. While I concur that geophysical changes are necessary to be taken into account wrt SLR, to say that ONLY geophysical changes are responsible for SLR and not the melting of ice caps is purely a lie and fabrication. Simple physics of putting an ice cube into a glass full of water shows that when it melts, it doesn’t overflow the edge – but at the same time, without that cube of ice in the glass at all, the level inside the glass to begin with is NOT THE SAME. to say that ONLY geophysical changes are responsible for SLR and not the melting of ice caps is purely a lie and fabrication. There isn’t enough ice melt contribution from warming to lead to those kind of substantive changes. For example, as Fettweis et al. (2017) pointed out last year, the total ice melt contribution to sea levels from the Greenland ice sheet between 1900 and 2010 amounted to +1.5 centimeters. That’s not going to cut it if the predictions are that we’ll get 1-2 meters of sea level rise by 2100. The Antarctic ice sheet has contributed nothing to sea level rise between 1800 and today — or even a net lowering of sea levels. And, as the article indicates, even in regions where sea levels are rising more than 5 mm/yr, the coastal land area has been growing/expanding over the last 115 years. What this means is that the height of the land area, or whether there is subsidence or uplift occurring, is the determining factor in relative sea level changes. Sea level rise/fall rates are much less significant contributors. And this is a global phenomenon: more land area is above sea level now (2015) than in the 1980s – despite the sea level rise that has occurred since the 1980s. 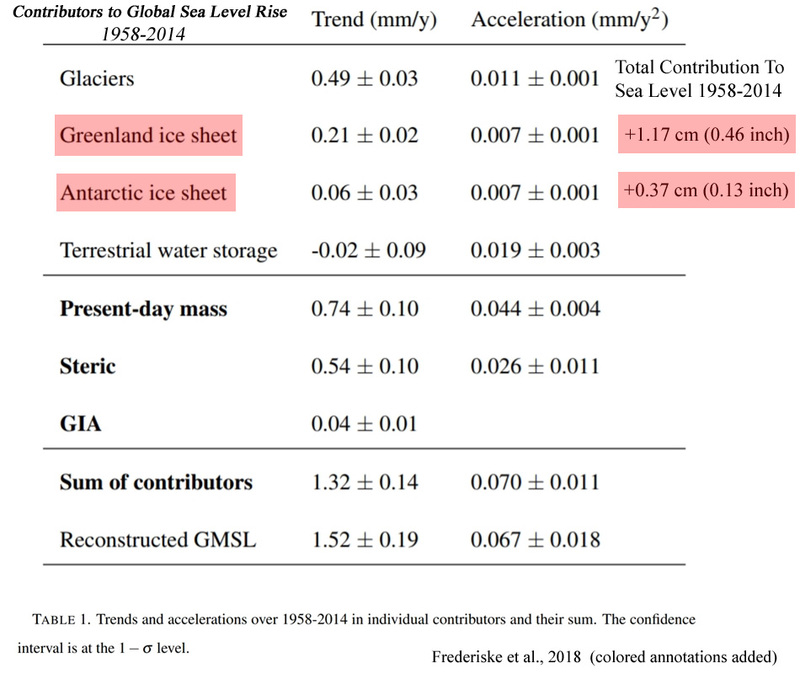 The sea level rise rates are not nearly as determinative as geophysical movements. I would caution that it is probably not a good idea to rush in and call scientists’ observations “lies” and “fabrications”. There major factors that I never seen talked about. At least 90 percent of the ice loss at the poles is caused by sublimation. This water is spread arou d the world through winds and then precipated. The ice is constantly replenished by snow. Changes in winds would cause significantly more SLR or loss than melt. Assuming this process is constant is not reasonable. The second is the basic properties of water…..below 4 degrees when it warms it decreases in volume. Over 90 percent of the oceans is less 4c. Roughly below 200m near the equator and 60m near the poles. I’ve tried to find a reasonable explanation how the properties of water change under the extreme pressure. As far as I can tell they can’t prove this happens..ie as it warms it expands… The Argo float data shows something happens as temperature approaches 4c. At the equator there a change in slope of temperature gradient. At the poles, there’s a reversal right at 4c.